The Vocal Breath, Embouchure, Open Teeth, and Firm Corners"
Step 1) The Vocal Breath: The breath used to play is the same breath used to sing. Whisper Tah, Too, or Toh (whichever you use) strongly for 4 beats. Now, use your throat to make the breath go higher like you were singing. Now go lower. Do not use your voice, just a strong whisper breath. The air speed and volume we use to play is controlled by the throat just like when you sing. Notice how much air it takes. You must first find the notes with your throat as if you were going to sing them. Your actual vocal range makes no difference since you don't actually use your voice. Blowing like you would blow up a balloon or beach ball is incorrect. The vocal breath has controlled sustain and is the correct use of breath. This is why it looks so effortless when you watch great brass players. The vocal breath will not play your horn alone, however, as it is vocal. You need the embouchure to focus it into an air stream and turn the vocal breath into wind. Step 2) Embouchure: Your lips focus the vocal breath into an air stream by funneling the air with your lips like a mild pucker, as if saying ooh. Your lips "grab" the air this way so it rubs them vigorously, making a strong sound similar to the letter F sustained-ffffff. 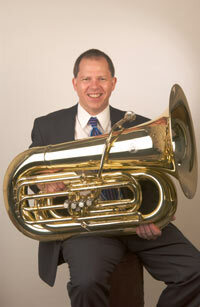 On tuba, this will be the high range sound. For the middle and low range, you will feel it more than hear it. It will sound like a low pitch vocal breath with an air stream you feel (like wind) if you put your hand out facing you at an arm's length away. Make sure this sound is lips only, no teeth. Your lips convert the vocal breath into an air stream so that when you put them in the mouthpiece they vibrate. Your embouchure must MATCH the speed and volume of breath from your throat (vocal breath). There is little your lips can do to make the air go faster or slower if the vocal breath stays the same. If your vocal breath stays on one note, the lips can only pinch or go flabby with little or no change in speed high or low. The vocal breath is still going when you use your lips, so both happen together at the same time and must move together. Learning to coordinate these two things is why a brass instrument is often harder to play at first. When you play this way it will feel like the horn is sucking the air right out of you. This is how you use more air correctly. It feels (to me) like the lips and vocal breath pull the air right out of you instead of you trying to force air against or through your embouchure. To form your embouchure to do this, you must keep your bottom lip basically in front of your lower teeth. Your bottom lip must stand up some to do this. The bottom lip generally stays in front of your lower teeth, regardless of range or volume. Not doing this and/or having the bottom lip roll out too much can cause double buzzes/split tones/brazing. The corners of your mouth firm when you grab the air with your lips and you get a "flat chin" when you slide the teeth below the bottom lip as it stands up. The corners and flat chin make a U shape around your lips. Your lips will slightly pucker towards the mouthpiece when you grab the air. To form your embouchure to do this, you must keep your bottom lip basically below your lower teeth. Your bottom lip must stand up some to do this. The bottom lip generally stays below your lower teeth, regardless of range or volume. Not doing this and/or having the bottom lip roll out too much can cause double buzzes/split tones/brazing. The corners of your mouth firm when you grab the air with your lips and you get a "flat chin" when you slide the bottom lip down in front of the lower teeth as it stands up. The corners and flat chin make a U shape around your lips. Your lips will slightly pucker towards the mouthpiece when you grab the air. If you have a High placement embouchure, your lips slide up your teeth to get closer together as you go higher, and back down your teeth as they move apart for lower. Your jaw will tend to be in (or back) for High Placement. If you have a Low placement embouchure, your lip motion will be the reverse of the High placement, sliding down as you go higher and back up as you go lower. Your jaw will tend to be out (or forward) for Low placement. If you have a Center placement embouchure, your lip motion will be the reverse of the High placement and similar to Low placement, sliding down as you go higher and back up as you go lower. Your jaw will tend to be in (or back) for Center placement. Let the mouthpiece follow your lips up and down your face as you change ranges. Your jaw may go up and down slightly. Your head may move up and down slightly as well, but not too much. This is called a pivot, but it should be slight.